The basic idea for the Latin-America Pavilion in Saragoza, Spain, was to develop a structure: easy to install and dismantle and economical. The elements and the building materials have therefore been chosen for economy, light weight and for being prefabricated. 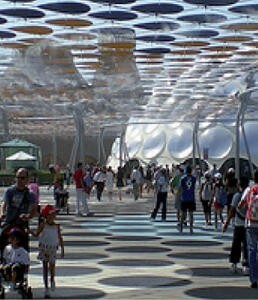 The textile PVC membrane net was attached to a steel structure and the shape was designed in order to create a tensile surface. There were curves that followed the building borders and there was one part of the façade with a balcony which was free to overlook the Ebro river. The structure has been more recently dismantled after the Expo and the material recycled according to the Texyloop of the Ferrari programme. Museotec has integrated a proposal in which container and content, besides being in harmony between themselves, also merge in an unique experience. One transforms in the other and the other in one: a transformation from emotion to concept and from concept to emotion.